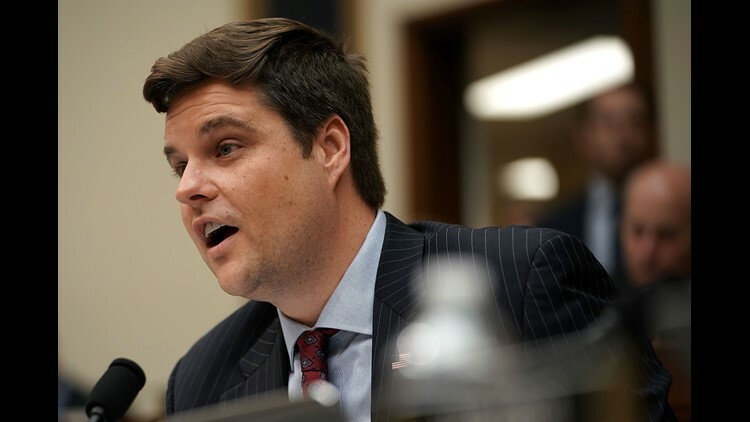 Rep. Matt Gaetz, R-Fla., speaks during a House Judiciary Committee hearing June 28. WASHINGTON — While House Republicans pressed Facebook, Twitter and YouTube officials about charges of anti-conservative bias Tuesday, Democrats complained that the giant social media companies are bending over backwards to appease conservatives. Facebook took the hardest hits from members of the House Judiciary Committee as lawmakers from both parties questioned how the company decides when to remove a controversial group's page from its platform. Rep. Matt Gaetz, R-Fla., asked a Facebook official why it still has not taken down the page of a group called Milkshakes Against the Republican Party, which has posted calls for Republican members of Congress to be shot. Facebook removed the group's offensive posts, he said, but allowed it to continue to maintain a page. Gaetz said a member of his staff wrote to Facebook to complain, and received a response saying that the group's page "doesn't go against our community standards." "How many times does this have to happen before the page comes down," Gaetz asked Monika Bickert, Facebook's head of global policy management. She replied that pages are removed "when a certain threshold has been met" but said that threshold varies from case to case. Still, she did say there is "no place for violent content on Facebook," which is why the specific posts advocating the killing of GOP lawmakers were removed. Democrats pointed out that the issue is not limited to groups that attack Republicans or conservative causes. Rep. Jamie Raskin, D-Md., asked Bickert why Facebook does not remove Infowars, the far-right site led by conspiracy theorist and radio talk show host Alex Jones. The site denies the mass shooting at Connecticut's Sandy Hook Elementary School in 2012 and calls the high school students who survived this year's mass shooting in Parkland, Fla., "crisis actors" posing as students. Bickert said that any posts labeling the Parkland students as actors are removed from Facebook. However, she said Infowars hasn't yet reached the threshold to have its entire page taken down. "When you've got Infowars and Alex Jones repeatedly denying the reality of mass shooting, at what point does the page come down?" Raskin said. He called the notion that social media companies are biased against conservatives "nonsense" and a "conservative fantasy." Democrats also questioned Bickert over the company's recent retention of former Arizona Republican Sen. Jon Kyl and his law firm as advisers to audit Facebook for any evidence of bias against conservatives. Facebook officials have also met with members of the conservative Heritage Foundation. "And you picked no Democratic senator or liberal think tank?" Raskin asked. Bickert said that Facebook has hired Laura Murphy, the former director of the American Civil Liberties Union's legislative office, to conduct a civil rights audit of the company. Rep. Karen Bass, D-Calif., said black activists have felt "over-censored" on the platform, and Bickert said Murphy will help address that issue. Judiciary Chairman Bob Goodlatte, R-Va,. said he believes the social media companies have made progress in becoming more transparent about how they make their decisions. But he said glaring mistakes continue to be made. "Just before July Fourth, for example, Facebook automatically blocked a post from a Texas newspaper that it claimed contained hate speech," Goodlatte said. "Facebook then asked the paper to 'review the contents of its page and remove anything that does not comply with Facebook’s policies.' The text at issue was the Declaration of Independence." Rep. Pramila Jayapal, D-Wash., questioned whether Facebook's political action committee should be giving political donations to Rep. Devin Nunes, R-Calif., the chairman of the House Intelligence Committee. Jayapal acknowledged that Facebook also has given money to Democrats in addition to its recent contributions to Nunes. But she asked whether it's appropriate for the company to donate to Nunes since his committee has investigated how Russia manipulated Facebook, Twitter and Google with fake accounts to try to influence U.S. elections. The congresswoman has introduced legislation that would prevent companies from donating to members of committees that have jurisdiction to regulate their industries. Nunes is a controversial figure in the congressional investigations of Russian meddling, and is viewed by Democrats as someone who has ignored evidence of the Trump campaign's ties to the Kremlin in order to protect President Trump. Jayapal challenged Facebook for donating to "an individual that is countering the Russia investigation, when you at Facebook are so deeply tied" to what the Russians did over social media. Bickert replied, "I know the Facebook PAC does have bipartisan contributions."